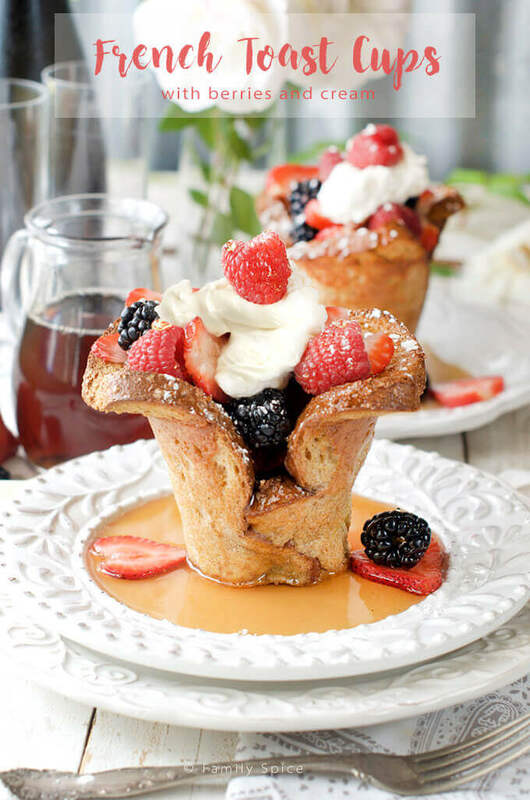 Whether you are making these for brunch for a crowd or a small family breakfast, these Baked French Toast Cups are simple to prepare and fun to eat. Sponsored by Davidson’s Safest Choice Eggs™. Breakfast is one of those meals I do not skip. In fact, I usually eat breakfast right after I get up in the mornings. I love all kinds of breakfast foods, too, from savory to sweet: omelettes, bagels, french toast, cereal. My husband and kids are not the same as me. So I typically eat breakfast alone. I don’t mind really. I find this time relaxing and meditative. I sit there and sip my morning tea and listen to the world wake up. When my kids were little, our mornings would explode from complete silence to total chaos. There would be a stampede of tiny feet trampling down the stairs. The house would be filled their laughter and giggles. Fights could erupt with a wrong look if one of those angels woke up on the wrong side of the bed. On the weekends, I would try to sleep in and my babies would crawl into bed with my husband and I, if they weren’t there already. I always attempted to go back to sleep, but my husband would start talking to them, then the talking would evolve into giggling and then a wrestling match would proceed. Now that my kids are teenagers, they don’t come visit us in bed anymore. I still enjoy my quiet breakfasts, I just have to wait for the chaos and kids to leave for school first. But the weekends are the time for family breakfasts and when I get fancy in the kitchen. 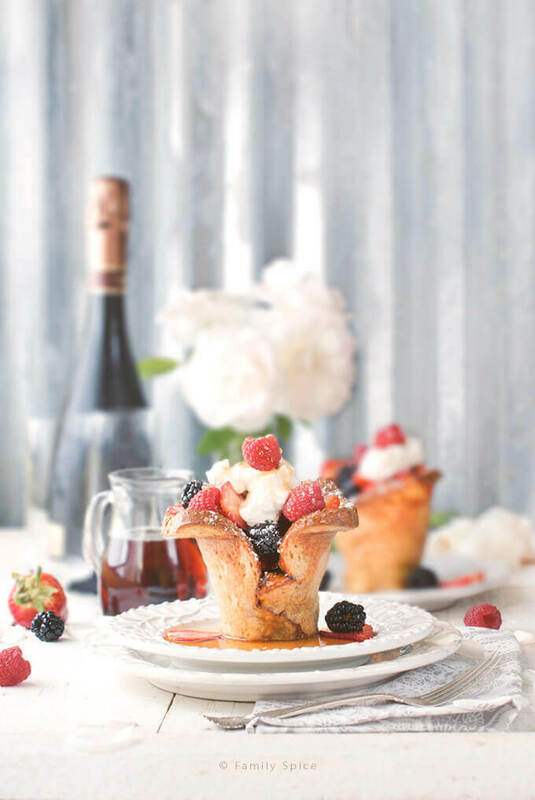 I make these French Toast Cups for my kids from time to time. They are simple to make. They also make a wonderful special occasion brunch like Mother’s Day, Christmas Morning or birthdays. 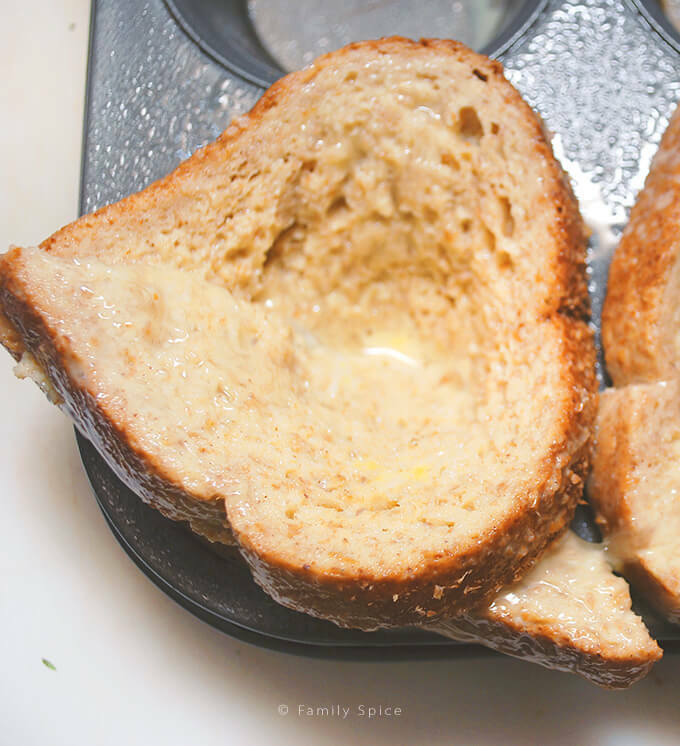 These big French Toast Cups were made with two slices of bread, soaked in the egg mixture and pressed into a popover pan (these are pictured above). But you can make smaller cups using one slice of toast and a muffin pan. If you want to make the smaller French Toast Cups, partially cut each slice of bread on the diagonal, but keep it intake at the corner. Then soak your bread into the egg mixture. Now gently press the egg soaked bread into a greased cupcake pan, folding the sides together to form a cup. The smaller cups, bake more quickly in the oven. So be sure to have all of your fixings and fruits ready to fill them up. You can stuff your French Toast Cups with just about anything. I just love using fresh fruits like strawberries, blueberries, raspberries, blackberries and peaches. For the extra bit of sweet, you can use whipped cream, maple syrup, or my kids’ preference, powdered sugar. In a blink of the eye, I went from being a mom of 3 toddlers to a mom of 3 teenagers. I’m not sure exactly how that happened because I can still see their baby faces when I look at them. Life is short, so hold your loved ones tight and share a laugh or two together. 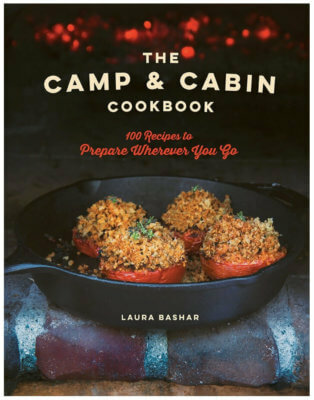 Apply non-stick spray to the inside cups and to the top of a 6-cup non-stick popover pan. Dip bread into egg batter, one at a time. 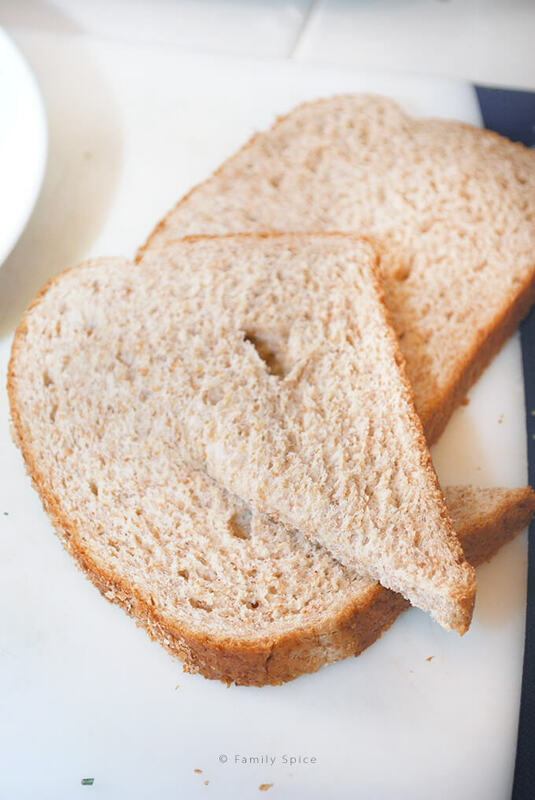 Flip bread over to soak other side of bread. Remove bread from egg mixture, allowing excess to drip back in the bowl. Press one slice of bread into a cup of the popover pan, filling up one side of the cup. Add a second soaked slice of bread into the same popover cup, filling up the other side of the same cup. Bake the toast cups for 20-25 minutes, until they're light golden brown. You want them to be lightly toasted, but still moist, so don't over-bake. If the tops start to brown too much before the rest of the cup is finishes baking, top loosely with foil. Allow the cups to cool slightly in the muffin pan before removing them. You might need to use a fork to help lift them out of the pan. When toast cups are cool to, remove from the muffin pan. You might need to use a fork to help lift them out of the pan. Serving Suggestions: Great for breakfast or brunch. You can also top with almond slices, toasted walnuts or pecan pieces. Top with whipped cream or cottage cheese. Cooking Tips: You can also make smaller French Toast Cups by pressing one slice of egg soaked bread into a muffin pan. Reduce baking time to 15 minutes. Top picture shows larger cup with two slices baked in a popover pan. Oh yes… it goes all too quickly and then they are off to college. I’m still reeling from dropping my son and he’s almost done with his first year! Enjoy them, every moment you can. 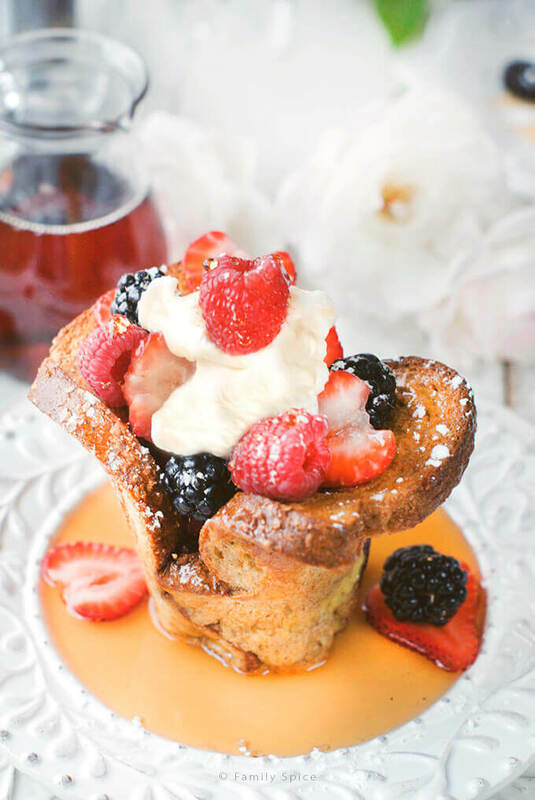 But I”m thinking that French Toast Cups would somehow make me feel better… I just may have to make these for me! Now THIS is the way I want to eat my French toast! YUM! And I have a carton of Safe Eggs in the fridge—love them!